As soon as I heard about this assignment, I knew exactly whom I wanted to research: Salvador Dali. In fact, I had only rediscovered this artist's work just a few days before this class began. Dali was an eccentric character whose imagination and personality came screaming through his artwork. His surrealist drawing style is attractive to the dreamer in all of us, and I tend to get a hyper-sexualized, almost violent vibe from his drawings and paintings. Dali combines beautiful uplifting fantasy imagery with that of a more dark and twisted brand, constantly walking the thin line between dream and nightmare. The main reason I identify with Dali so much is that his style is the closest, in terms of subject matter, to mine. I’ve pushed myself to draw from observation in this class and make my weaknesses grow into strengths, but the work I did before enrolling this semester often looks very similar to a Dali piece. Another thing I admire about Salvador Dali is his confidence, a swagger that most would deem as utter arrogance. I remember a quote in which he claimed, and I paraphrase, how much pleasure he gained from just being Salvador Dali. He also swore he didn’t do drugs, but that he in fact was drugs, which I found hilarious. Author Robert Descharnes described Dali’s popularity, or rather the lack thereof, by saying this “Dali’s genius, which would have been freely acknowledged had it flowered in the Renaissance, is today so out of the ordinary that it provokes our modern world of average bureaucrats. There are still many who misunderstand this provocation and protest that he is crazy.” (Descharnes) Here are a few of Dali’s pieces that I found for the first time in Lilly, and enjoyed. Technology has revolutionized art, enabling artists to become all the more creative because of the plethora of possibilities and media that they are given. Adobe Photoshop, one of the most powerful tools known to the artistic world, has opened up a brand new universe that is digital art, a media that can imitate traditional art laying down pixels using mathematically rendered brushes. As we progress into the era of technology, we come to accept the luxuries that the copy/paste, paint bucket and path render tool give us, and we forget that not too long ago, artists did many things by hand -- and most still do. 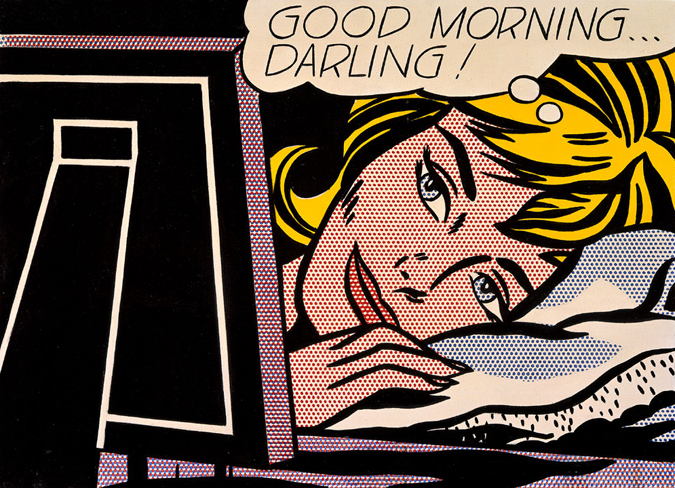 Roy Lichtenstein was born on October 27, 1923 and lived until September 29, 1997. He was an American pop artist and walked alongside Andy Warhol and Jasper Johns leading the new artistic movement. 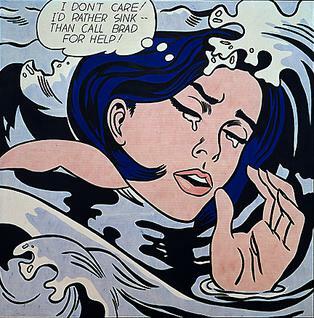 Pop art came about in the 1950's, incorporating aspects of mass culture and advertisements. His works were mostly inspired by comic books, where he painted renditions of the comic strips on canvas. My favorite series of his work (this was also the work that he was most famous for) are his girl pieces. All his pieces feature great use of different techniques and aspects of his drawings that I admire and definitely working on getting better at. First off, I think his usage of line strokes is extremely unique. Comic artists play around with using black ink strokes to represent shadow and space all the time. Roy creates a different effect with his paint on canvas than a ink on paper, taking advantage of the kinds of thicknesses of lines he could make with brushes. With just black lines and blobs, he is able to create the waves in her hair along with the waves in the water that is churning around her. Another thing I found intriguing about his work was the intricacy of his paintings. He kept true to his inspiration, adopting the technique of Ben-Day dots to show certain colors. He used little red dots to make the illusion of the color of skin, bunched those red closer together to create lips and lined up red dots and blue dots to create a pattern for a picture frame. One last thing that really struck me about his work was that in the book Lichtenstein: Girls, Dorthy Lichtenstein said the following comment about his artistic approach: "...he designed an easel that rotated. This way, he could work on a painting sideways and upside down. And he usually worked with a mirror in the background to get as much distance from the canvas as possible, so he could try to see it as a whole and in reverse." This is a technique that I use a lot in my work and is something that I've seen many digital artists now use to check that their work is whole and looking great from every perspective. Using a mirror in the background is something that I do want to try out the next time I'm drawing, I really want to see how that works and experience the "distance"! While studying abroad in Italy this past semester I had the opportunity to go to Paris. Maybe it was because it was nice to see art other than crucifixes and Madonna and Child's, but during a visit to the Musée d'Orsay I saw a painting that I just fell in love with. 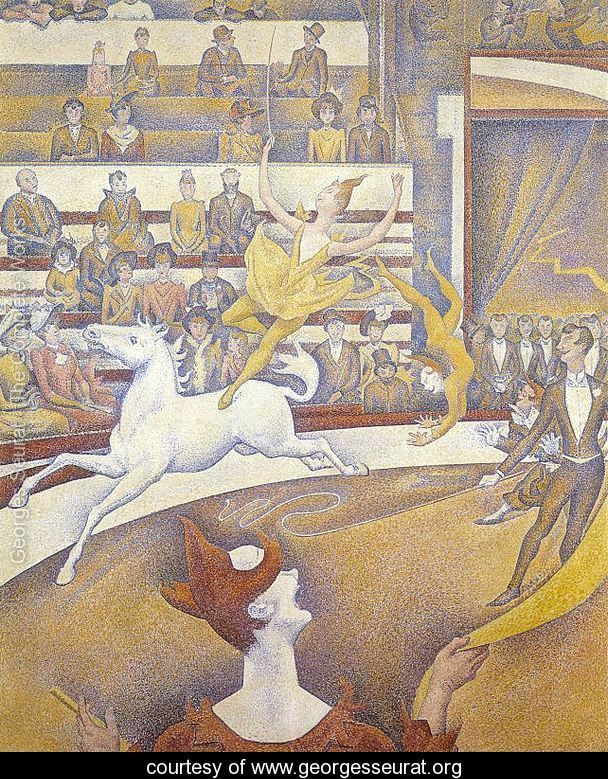 It was The Circus by Georges Seurat. 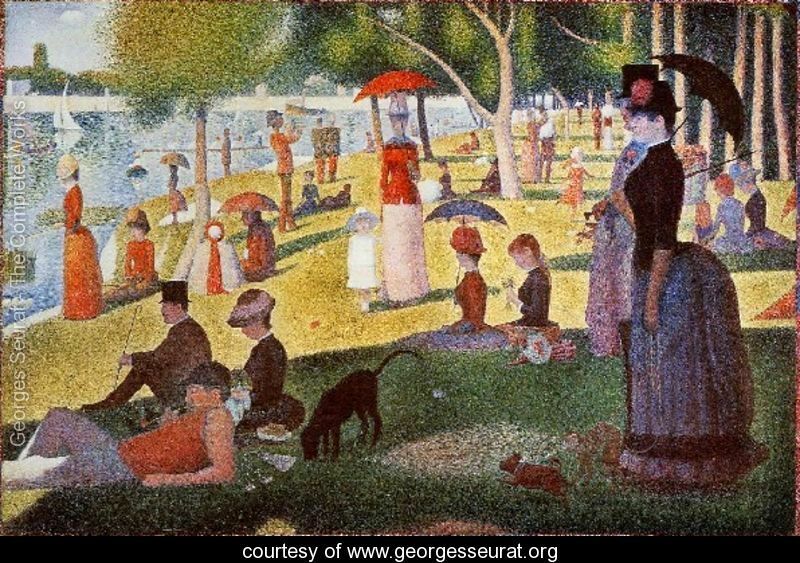 I had no idea until researching for this assignment that Seurat is also the artist responsible for one the most recognizable works of western culture, A Sunday Afternoon on the Island of La Grande Jatte, previously known to me as "The people with umbrellas in a park." Georges Seurat was born on December 2, 1859 in Paris, France. He studied mostly under a sculptor by the name of Justin Lequein and became interested in antique sculpture and Renaissance Painting. In his own work he was labelled a neoimpressionist. One of the reasons I was immediately attracted to the The Circus was because it utilized pointillism, which is a technique I have little experience with myself, but have always found interesting. Seurat played a large role in developing the pointillism style and he arguably invented it. Seurat differed from his contemporaries in that he had a strong interest in science as well as art, specifically the science of color theory. He wanted to break up each color into it's parts (a process known as divisionism) and let the eye blend the colors optically. The required each component color to be drawn as a single point, which led to pointillism. His interest in science led him to producing his paintings in a very scientific, methodical process which included completing several study drawings of each element of a painting before creating the final product. Below are some examples of his study drawings. The two colored pencil drawings, though completed years before either painting, could possibly be early study drawings that inspired the dominant character in each of the paintings mentioned above. "Georges Pierre Seurat." Encyclopedia of World Biography. 2nd ed. Vol. 14. Detroit: Gale, 2004. 120-122. Web. 1 Mar. 2012. "Georges Seurat: The Complete Works." Georges Seurat. 2012. Web. 29 Feb. 2012. <http://www.georgeseurat.org/>. Seurat, Georges, and Jodi Hauptman. 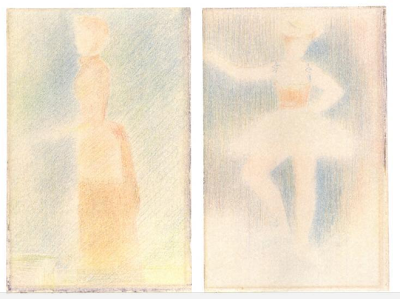 Georges Seurat: The Drawings. New York: Museum of Modern Art, 2007. Print. Edgar Degas was a french impressionist artist born in Paris in 1834. His role model for most of his life was his father, since he was the oldest of five children and tragically lost his mother at age 13. Yet after years of schooling when his father wanted him to be a lawyer, Degas refused and instead decided to pursue his artistic dream. Degas had a natural talent for drawing and painting since the time he was young, and he found his classes at the law school to be unbearable boring (Thomson). Although his early work was well-received in the Parisian salons of the time, Degas soon turned against the rigid structure France's art scene and joined the Impressionists. This is when he became more experimental in his artwork, exploring a number of different subjects, and eventually using "virtually every medium known in his lifetime"(Brettell 7), including pencil, charcoal, oil paint, pastel and bronze (DeVonyar). Degas himself never liked the word impressionist, he preferred to be called a realist, however he is often considered one of the most important painters in the founding of impressionist art. As he grew older, Degas began to gradually lose his eyesight, fearing that he might become totally blind by the mid-1880s (DeVonyar). As his eyesight grew worse, his work become more and more expressive and less realistic, pushing him farther and farther away from fame during his lifetime. Like many artists though, he was recognized and held in high regard after his death and is still admired by so many today. 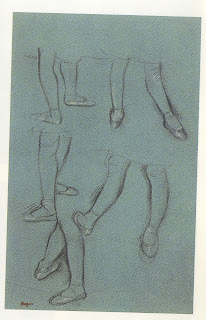 Although Degas studied, drew, painted, and sculpted a number of different subjects, he is best known for his work with dancers, specifically ballerinas. This is the main reason I chose to research him, because I am a dancer myself and have been dancing ballet my whole life. 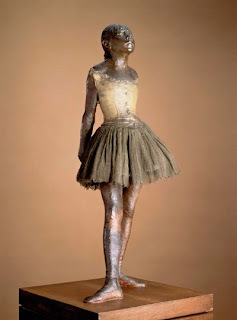 When I was younger, my mother used to take me to the Metropolitan Museum of art in New York to see Degas' ballerinas, especially his famous statue, Little Dancer of Fourteen Years. This sculpture has caused a lot of controversy since some people find the dancer to be ugly and snobbish-looking. The dancer is standing in fourth position, with her arms stretched behind her back and her nose up in the air. The most striking part of this sculpture the first time it was exhibited is the fact that Degas dressed her in real clothing; real ballet slippers, a real gauze tutu with a linen bodice (Brettell 97). Degas spent years studying and preparing for this sculpture, drawing and sketching fourth position over and over again, so he could perfect it from every angle. 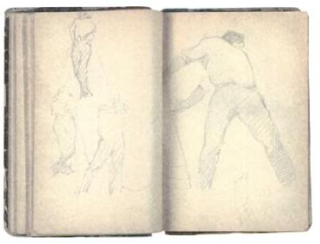 In preparation for the sculpture, Degas made a smaller, model statuette and "at least sixteen preparatory studies" (Brettell). 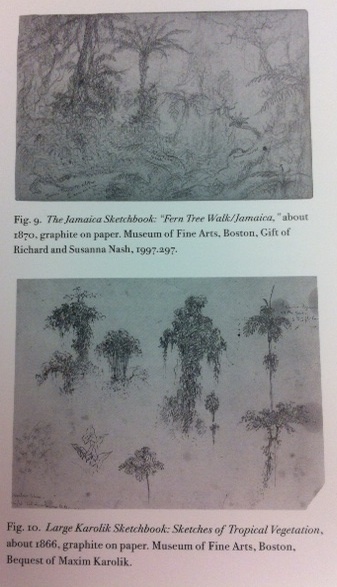 The study sketches shown above represent just a small portion of the preliminary work that went into this piece. 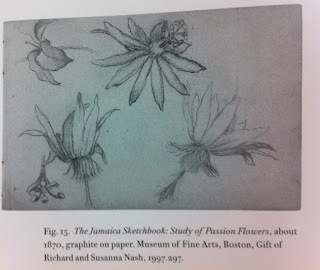 It also shows his use of a variety of different mediums, all in one drawing, even just at the sketching/studying phase. 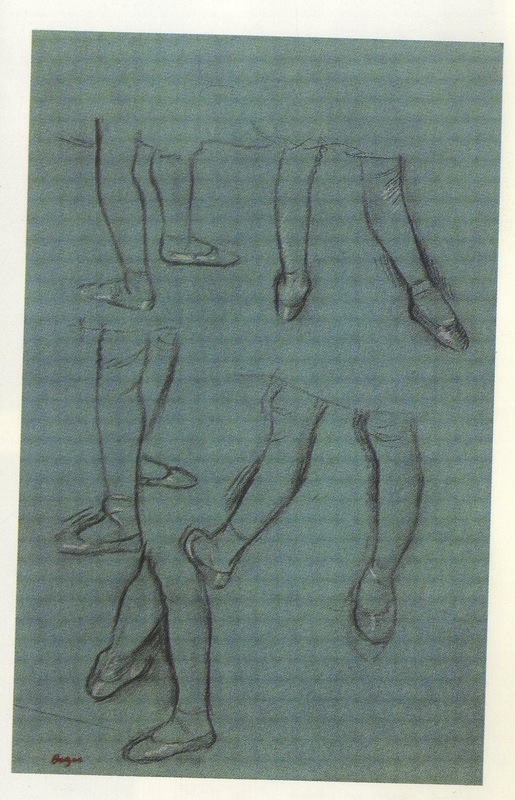 Degas was absolutely fascinated by dancers. 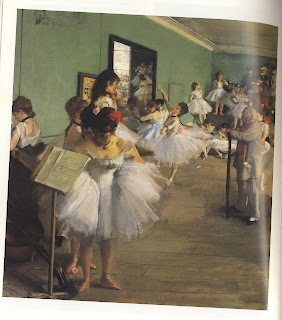 He spent a lot of time at the dance studio, watching class or observing rehearsals, sketching the whole time (Thomson). What makes his work unique is that he does not show dancers posing on stage, in full costume and makeup, but rather he shows them resting, stretching, adjusting, or sometimes just thinking in class or rehearsal. Placing his dancers in a relaxed setting, either in the studio or backstage rather than on the stage itself, makes his subjects more relatable and realistic than their magical stage personas of fairies, princesses, or nymphs. He presents the dancers as people rather than as characters. Another one of his most famous works, The Dance Class, shows this more realistic portrayal of the ballet world. There is only one girl actually dancing in the center, with the rest of the dancers off to the sides, yet the focus is not even on the girl in the middle. It is almost as if she is part of the background, and the girl adjusting her skirt on the side of the room is the main character of this piece. The point of view of the painting is that of another dancer, or maybe a musician or a teacher, as opposed to the view of an audience or the rest of society. 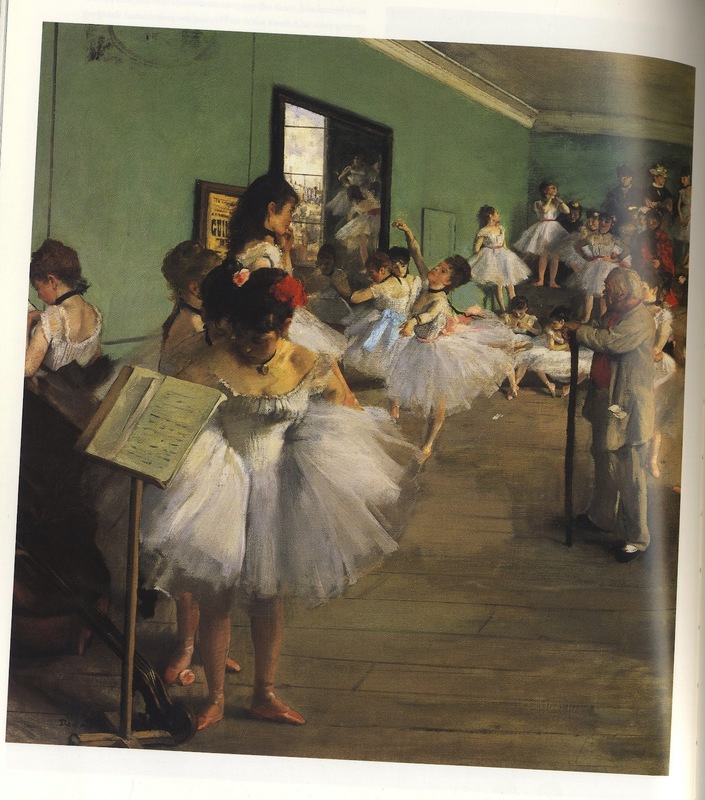 His work shows that there is more to being a dancer than just tiaras, tutus and pink satin shoes; Degas shows the hours of work and hardships faced by dancer in everyday life during the 19th century (DeVonyar). Brettell, Richard R., and Suzanne Folds McCullagh. Degas in the Art Institute of Chicago. New York, New York: The Art Institute of Chicago and Harry N. Abrams Inc., 1984. Print. DeVonyar, Jill, and Richard Kendall. Degas and the Dance. New York, New York: Harry N. Abrams Inc. and the American Federation of Arts, 2002. Print. Thomson, Richard. The Private Degas. New York, New York: Thames and Hudson Inc., 1987. Print. 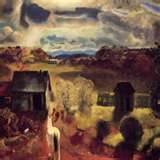 George Bellows (1882-1925) is known for his drawings, lithography prints, and paintings. Bellows was born to an architect father and a strong mother in Columbus, Ohio. He attended the University of Ohio, where he played baseball for three years. Bellows passed up a professional ball career to pursue a career in the arts, traveling to New York City where he met his mentor, Robert Henri. Bellows quickly became successful, and his work sold quickly to major galleries, institutions and museums throughout out the nation, and traveled throughout the world. Bellows’ work is championed for it’s unique American quality. Bellows strength was in his ability to stay true to his own vision. In doing so he created work with integrity, that was not confused or diluted by movements of the time such as Cubism, Futurism, and modernism. Bellows has an honest interest in the common man, which shows in his work. His subject matter ranges from prize fighting scenes, intimate portraits of his family, and landscapes to female nudes. 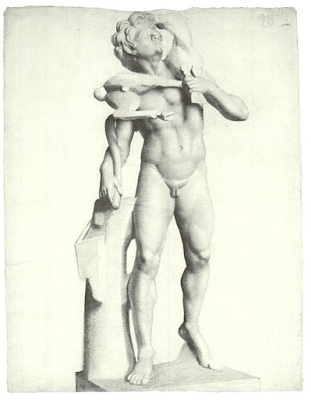 Bellows died a relatively young death when his appendix burst in 1925, cutting short a fruitful career. 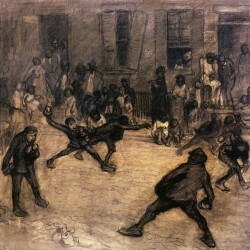 Drawing Tin Can Battle, San Juan Hill, New York, 1907, Crayon, ink with charcoal, 21'x24 1/2"
Bellows drawings were not only studies but complete works in themselves. Bellows' strong sense of compositional structure, rythym and drama propelled his work. The Murder of Edith Carvell, 1918, lithograph, 20 3/8"x 25 7/8"
Bellows was interested in dramatic subject matter, sometimes of a political nature. Edith Carvell was a German nurse who helped English, French and Belgian soldiers escape during the German occupation of Belgium. She was discovered, accused of treason, and was executed before a firing squad. 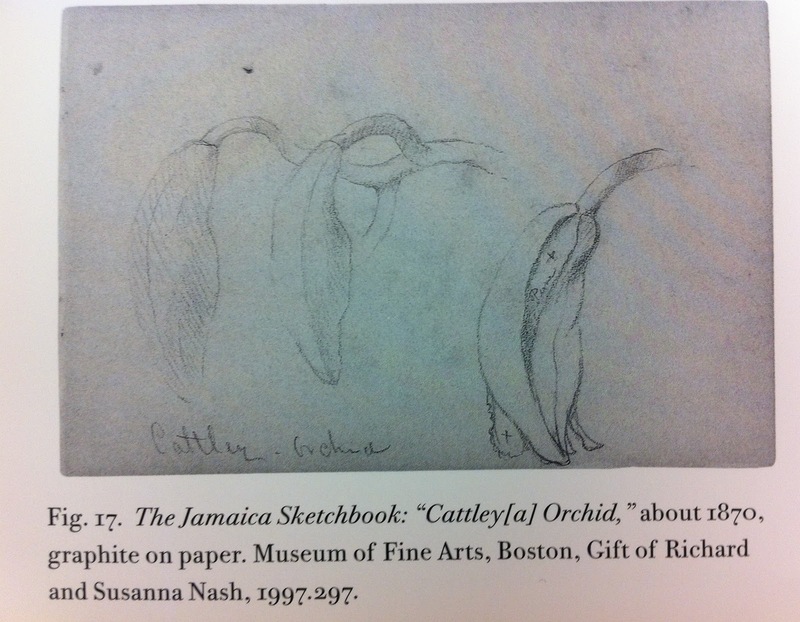 Considered Bellows' best landscape by Peyton Boswell (see bibliography) because it showcases Bellows' "...aesthetic gifts- in draftsmanship, in color and in emotional content." 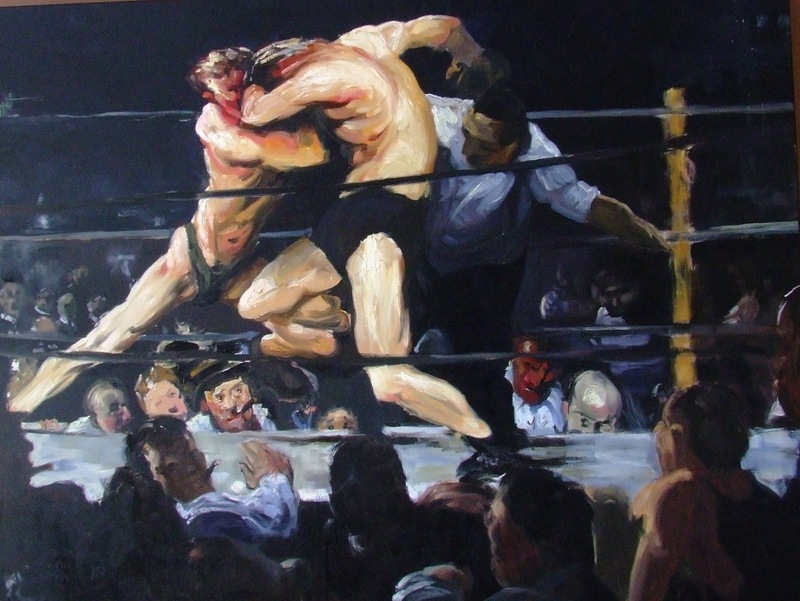 Stag At Sharkeys, 1909, Oil on Canvas, 36 1/4"x48 1/4"
One of Bellows famous prize fighting scenes, his most widely recognized work. Boswell, Peyton. George Bellows. New York, NY: Crown Publishers, 1942. Print. Haverstock, Mary. George Bellows: An Artist in Action. London: Merrell Publishers Limited, 2007. Print. When I first began looking at photographs in the library, I wanted to research an artist who spent a great deal of time on landscape and nature. 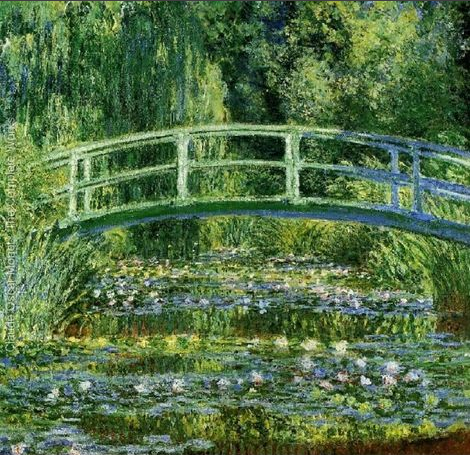 When I came across a photograph of a painting of a bridge with flowers and trees, which reminded me of the Duke Gardens. Nonetheless, I remember talking to Professor Fick about my reservations with trees and bushes—with nature. He told me that I did not have to draw an outline of a tree or bush; he said that I should shade in values and create what looks like bushes and trees through shading. When I saw this Water Lily Pond painting by Claude Monet, I began to understand more about what Professor Fick was referring to. The bushes, trees, and lilies are not perfectly defined, but it is clear that these are bushes and lilies regardless of their more abstract look. I then began to look into more of Monet’s work and like what I saw. I even did a bit of background information to see what led him to begin to look into landscape work. Oscar-Claude Monet (1840-1926) is a famous French painter and one of the founders of the Impressionism movement. Claude Monet was born on November 14, 1840 in the ninth arrondissement of Paris. He was the second son of his parents Claude Adolphe Monet and Louise-Justine Aubree. Monet entered the Le Havre secondary school of the arts and became known locally for his charcoal caricatures. He also undertook his first drawing lessons from Jacques-Francois Ochard, a former student of Jacques-Louis David. In late 1856, early 1957, Monet meet fellow artist Eugéne Boudin who became his mentor and taught him to use oil paints. Below are some of Monet’s earlier works in his caricature drawings, from which Boudin saw potential in. These caricatures are amazing. He uses different mediums and different ideas. The last one with a head on what seems to be on a bee attracts me because it relates to what we just did in class today. We tried to incorporate placing objects on other objects combining both real landscapes (or for the sake of class still life objects) and objects from photographs. 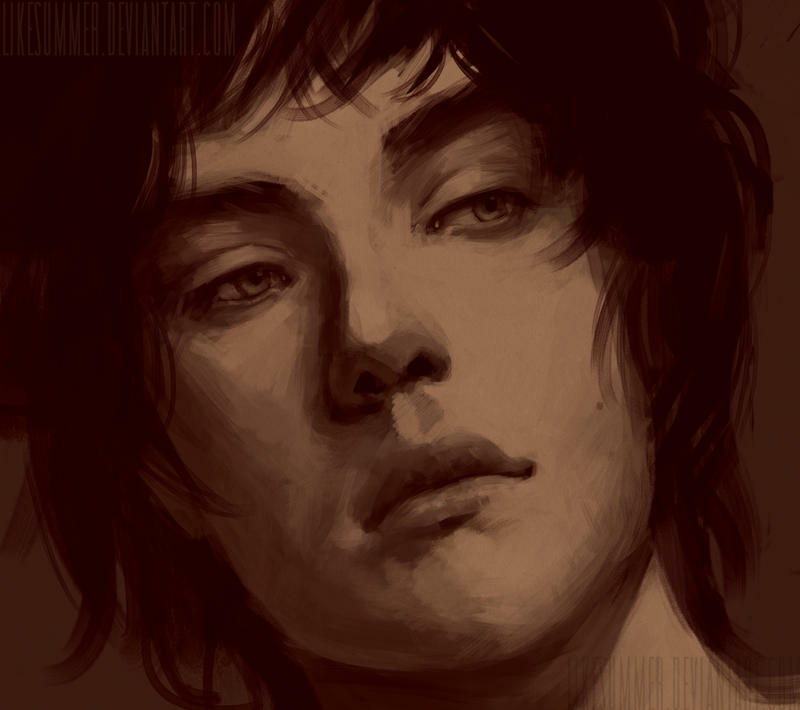 I am also attracted to his shading technique. I still find it quite difficult to properly shade and add color and depth to places, but Monet seems to do this quite well in his charcoal caricatures as a growing artist. Monet rejected the traditional approach to landscape painting and instead of copying old masters he had been learning from his friends and the nature itself. Monet observed variations of color and light caused by the daily or seasonal changes. I like that he tries to learn from observation and experience, which can be seen through his travels and the inspiration for his impressionalism work. From 1871 to 1878 Monet lived at Argenteuil, a village near Paris, where he painted some of the most famous works of the Impressionist movement. In 1878 he moved to Vétheuil and in 1883 he settled at Giverny. From 1890 he concentrated on series of pictures in which he painted the same subject at different times of the day in different lights such as Haystacks or Grainstacks (1890-91) and Rouen Cathedral (1891-95). 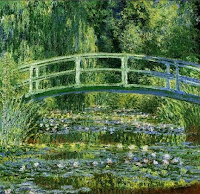 He continued to travel widely, but his attention was focused on the celebrated water-garden he created at Giverny, which served as the theme for the series of paintings on Water-lilies that began in 1899 and grew to dominate his work completely. His landscape and Impressionism paintings are beautiful and take into account the foreground, background, and mid-ground. I love the richness and color yet creativity and lack of complete structure, which is something that I need to develop and work on. "Claude Oscar Monet - The Complete Works." Claude Oscar Monet. Web. 01 Mar. 2012. "POUL WEBB ART BLOG." : Claude Monet. Web. 01 Mar. 2012. I have always been amazed by landscape paintings so real that you feel like you could step right into the scene. It was only natural for me to become fascinated by the members of the Hudson River School. A mid 19th century American art movement influenced by Romanticism and represented by a group of landscape painters. 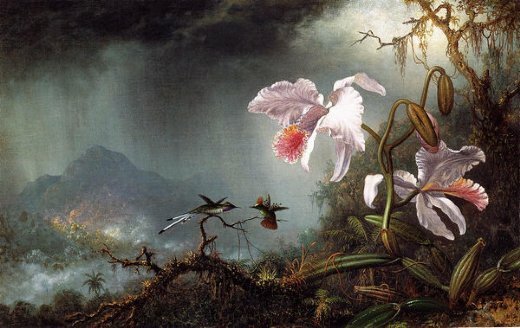 Although each member of this movement creates remarkable pieces, one painter in particular caught my attention, Martin Johnson Heade. Heade was was born in 1819 in Lumberville, Pennsylvania and received little art training before producing his first portraits. After time spent traveling in Europe, he displayed his first work in Pennsylvania Academy of the Fine Arts in Philaldephia in 1841. 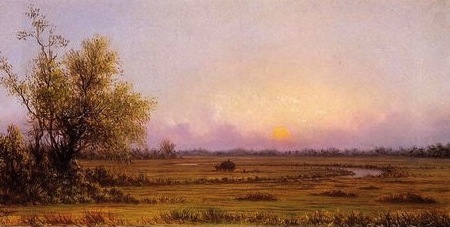 Though classified as a Hudson River School painter, Heade did not always do landscape paintings and his earlier paintings are often overlooked. Heade began his career painting portraits, and then transitioned to landscape through tropical scenes of birds and intricate flowers. These sketches reveal a great deal of time spent studying his subjects. 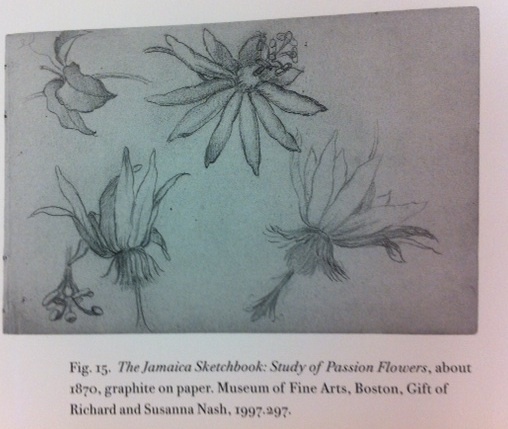 Both the flowers are drawn several times from different views, which allows him to create a very realistic scene as he becomes more familiar which his subject. These drawings also allow him to have a reference for when he is painting the final project. The same can be said for his later sketches. 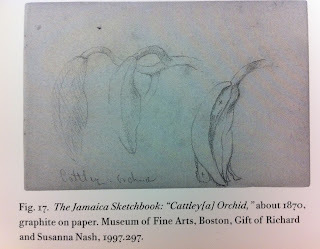 Again the vegetation in the sketches is drawn repeatedly to understand how it falls. The last sketch is more of a study drawing, just like the ones we do in class, which allowed him to determine how he wanted the final painting to look. Here are just a few of my favorite works. 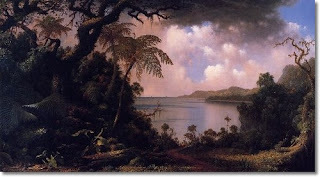 Martin Heade stands apart from other landscape painters because of his use of arbitrary color. The subtle blues and purples in the white of the flower make Two Fighting Hummingbirds with Two Orchids more interesting than just a realistic painting of two birds and two flowers. He also uses this technique in his landscapes, noticeably with the pinks in the sky and the reds in the path way (in the last painting). It is a technique I try to use in my own art as well. I enjoy placing colors that don’t necessarily belong there but enhance the piece. "Martin Johnson Heade Biography." Martin Johnson Heade. Web. 29 Feb. 2012. <http://www.martin-johnson-heade.org/biography.html>. Favis, Roberta Smith, 1946-. Martin Johnson Heade in Florida. Edited by Martin Johnson Heade. Gainesville: University Press of Florida, 2000. Stebbins, Theodore E. Martin Johnson Heade. Edited by Janet L. Comey, Martin Johnson Heade,Los Angeles County Museum of Art., Boston Museum of Fine Arts, National Gallery of Art (U.S.), Karen E. Quinn and Jim Wright. Boston; New Haven: Museum of Fine Arts; Published in association with Yale University Press, 1999. "Hudson River School." Wikipedia. Wikimedia Foundation, 26 Feb. 2012. Web. 01 Mar. 2012. <http://en.wikipedia.org/wiki/Hudson_River_School>. "Is he the greatest living painter in the United States?" Life asked in 1949 to the American public, echoing the words of art critic Clement Greenberg. Indeed, without a doubt Paul Jackson Pollock is considered one of the most influential American painters of all time. But he was a man veiled in mystery, as seen by the title of one of the popular documentaries on him, Who the #$&% is Jackson Pollock?, and relatively unknown prior to his appearance in Life. What were the foundations for his inspiration, what profound effects did he have upon his contemporaries, and further, his legacy on the art world? His works were the culmination of prior art movements and mentors, yet he also synthesized something so completely novel and distinct, evolving his style over time until he attained perfection, that it is no wonder he is the artist of the most expensive creation ever sold, No. 5, 1948. He was recognized as one of the foremost leaders of the Abstract Expressionist movement. During this movement, Pollock studied historical works of art rather than contemporary works, going back to the Aztec, Mayan, Incan, and African influences. This primitive, romantic style arose in his work, as Pollock used the mind as "the artistic muse whose powers must be first unleashed" in "unbridled outbursts" and then "regrouped into . . . order" (Hobbs 299). How did he arrive at his unique technique though, now instantly recognizable and defined as drip painting? His works during this period appeared clairvoyant, as he poured out his mind into the drawings, infusing symbols and thoughts. He continued these until he could claim "the source of [his] painting is the unconscious," becoming a complete manifestation of psychic automatism, and, until he could declare himself that “the painting has a life of its own” (Hughes 468-69). Pollock’s unique contemporary style is what caught my eye. He was the leader of a movement, and his works are quite distinguished from the art at the time, and even now his effects are being felt. He used his all-over, drip painting technique to make massive oil paintings such as Lavender Mist: Number 1, 1950, placing the canvas on the ground and working around it. He worked in layers upon layers upon layers, using the brush and can to spread the paint as you can see in this picture, and he made this masterpiece utilizing his unconscious, so the image here is almost like his dreams being unleashed in the visual world. Full Fathom Five, the image here, was an earlier painting (1947) when Pollock was first developing his techniques. His method of pouring cans over a canvas laid out on the floor began around here, and he was vary the strokes and drips by how quickly he moved the paint, or by how long he let the painting settle. As before, there is a lot of depth within the image, and it looks vibrant and multidimensional, as the controlled and carefully though out strokes were layered on the painting, yet still looking almost accidental and unconscious. The following painting, The Moon-Woman Cuts the Circle (1943), demonstrates Pollocks earlier phases, before his more famous drip paintings. He explored ancient works, such as cave paintings, searching for a more primitive and prehistoric style. The painting is extremely rough, but Pollock still put in his usual dedication and fervor, struggling with expressing freedom on his lines and defining the work to be his own. Images provided by jacksonpollock.com, scanned from books. Arnason, H. H. “Abstract Expressionism and the New American Sculpture.” History of Modern Art: Painting, Sculpture, Architecture, Photography. Ed. Marla F. Prather and Daniel Wheeler. 4th ed. New York: Harry N. Abrams, Inc., 1998. 437-42. Print. Dempsey, Amy. “Abstract Expressionism.” Art in the Modern Era: A Guide to Styles, Schools & Movements. London: Thames & Hudson Ltd, 2002. 188-91. Print. Hughes, Robert. American Visions: The Epic History of Art in America. New York: Alfred A. Knopf, 1997. 465-97. Print. Hobbs, Robert C. "Early Abstract Expressionism and Surrealism ." Art Journal. “Jackson Pollock,” Web. 1 March 2012. <http://jacksonpollock.com>. e grew older, Goya began to severely criticize his life and he became disillusioned and embittered with society and mankind. 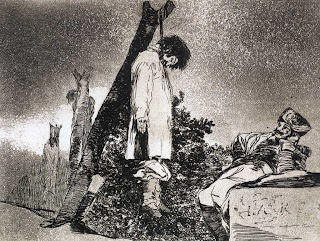 The death of his wife Josefa in1812 and the Peninsula War from 1808-1814 led Goya to a darker world where he abhorred everything and everyone surrounding him. 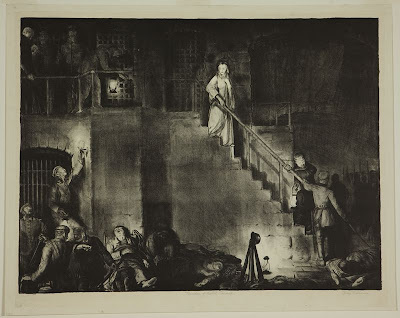 During the Peninsula War, Goya made The Disasters of War, which were a variety of prints created between 1810-1820. These plates were a form of visual protest against the violence demonstrated in the war. The etching Here Neither illustrates the many massacres, violence, profanities, and crimes committed by both the French and Spanish armies during the Napoleonic occupation. The etching depicts how innocent civilians were brutally hung by the Frenchdue to the unjust war and occupation. This etching of Saturn Devouring His Own Son (1821-23) was one of the most powerful images in The Disasters of War. The image served as an allegory of Spain destroying her own people in the Peninsula War instead of providing love and protection for them. Goya questioned the excesses of his imagination in Capricho No. 43, a self-portrait. In the portrait his head lies against a solid base, which serves as a metaphor for order within the world, while he is in the middle of a nightmare. He entitled the portrait "The sleep of reason produces monsters,” and described it as a depiction of how “imagination abandoned by reason generates monstrosity; together they form the mother of the arts and the origin of marvels.” This clearly illustrates Goya’s descent into Romanticism from where art does not redeem the hardships of life but rather illustrate and portray them. I specifically chose Francisco de Goya as my artist because I became entranced with his etchings and paintings from The Disasters of War. The pain and horror depicted in them really intrigued me. I love the darkness and revolutionary matters that overwhelm the disturbing images that he created. I also particularly liked his style of etchings on plates and the shadows presented in them which allow for a darker setting for his images. "Goya." Image One, Inc. Web. 01 Mar. 2012. .
Hughes, Robert. Goya. New York, Alfred A. Knopf: 2003. Print. Hull, Anthony. 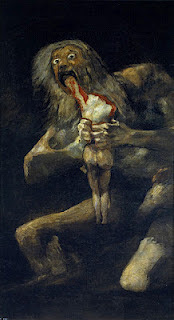 Goya: Man Among Kings. London, Hamilton Press: 1987. Print. "Trivium Art History." Francisco De Goya Y Lucientes. Web. 01 Mar. 2012. .